Observed in a farming area of Eldoret, Rift Valley, Kenya, Africa. October 2010. Among the plants that African farmers may be happy to have growing in their fence rows is this one. Sharp, strong thorns on durable woody branches discourage trespassers, man and beast alike. 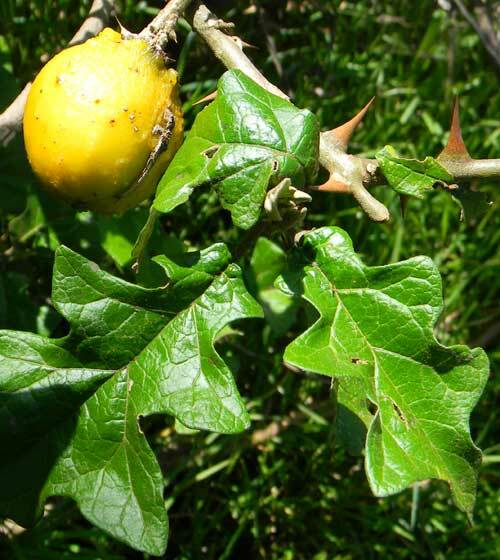 It is also rarely consumed by goat or cattle in part because of those sharp thorns. But mostly, mammalian herbivores avoid it because the foliage is laced with very bitter and toxic alkaloids. 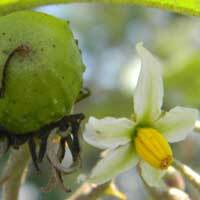 With maturity the fruits are about 4 to 5 cm in diameter, egg-shaped, and yellow. The surface of the fruit is bumpy - almost thorny, reminiscent of the branches. This plant is a close relative of the tomato. Copyright Michael J. Plagens, Created on 26 February 2011.